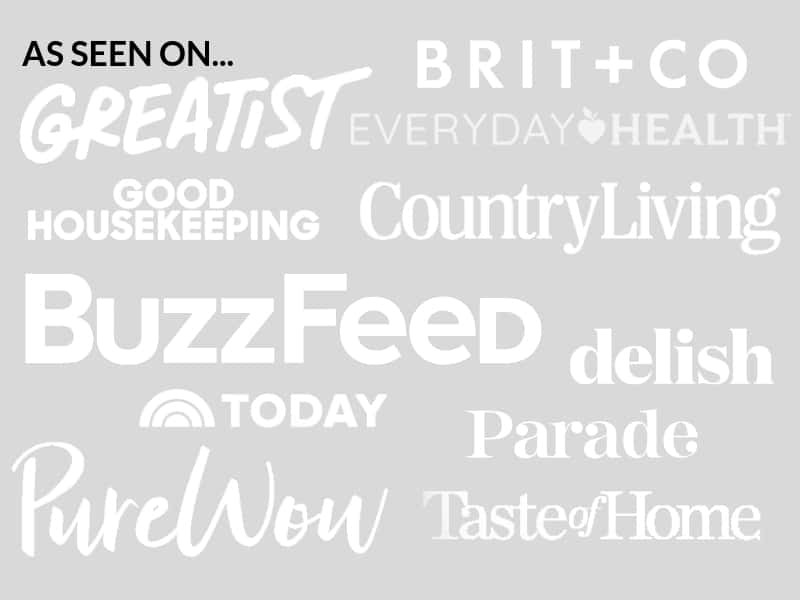 July 19, 2018 By Elizabeth Lindemann 5 Comments / This post may contain affiliate links. 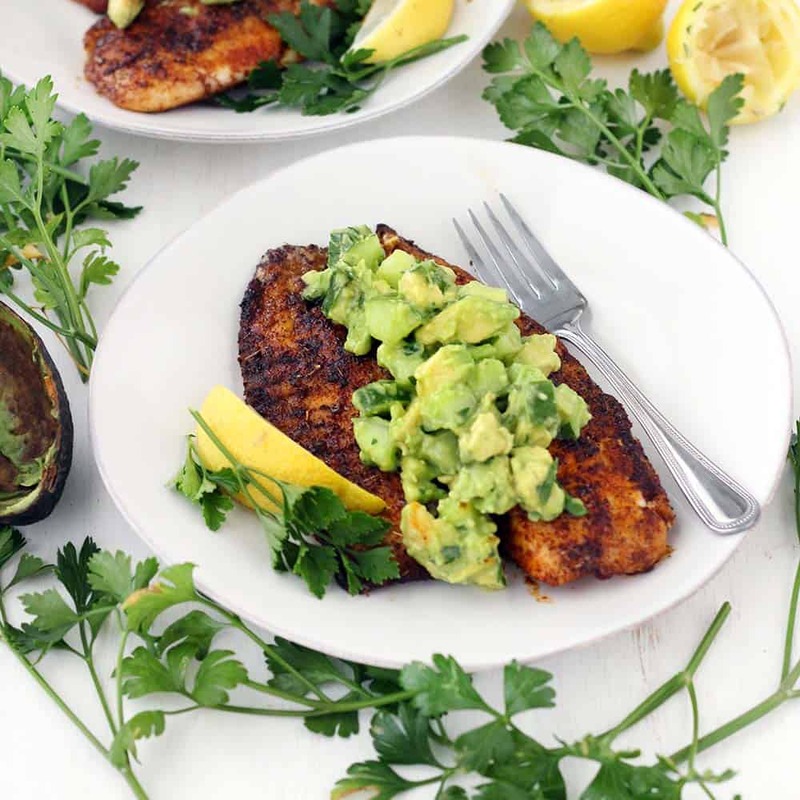 This Blackened Tilapia is packed full of spicy Cajun flavor and comes together in LESS THAN 10 MINUTES! Topped with a cool and refreshing avocado cucumber salsa, this is the perfect quick and easy low-carb recipe. It’s ridiculously fast and easy to make this blackened tilapia. With the help of some very high heat and pre-mixed blackening seasoning, this is a no-fuss recipe that’s perfect for busy weeknights. For a 100% paleo/whole30 compliant or dairy-free recipe, you can use ghee or olive oil instead of butter. I like using butter because it’s more authentic- the milk solids in the butter also become a bit burnt, enhancing the blackened flavor. I used a store-bought blackening seasoning for this, but you can easily mix up a homemade version. I was just feeling a bit lazy. There’s just something about having two kids under two makes me want to simplify my cooking even more than usual. 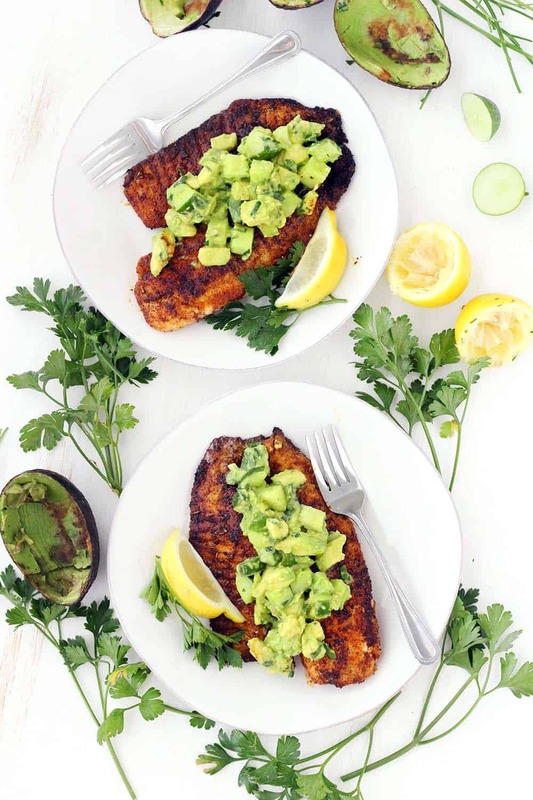 The avocado cucumber salsa is a deliciously refreshing accompaniment to the spicy blackened fish. It’s so easy to throw together in a few minutes- just mix some diced avocado, diced cucumber (seeds removed, so it doesn’t get too watered down), parsley, lemon juice, and salt together in a bowl. Done. And the fish could not be easier to make. Here’s how. First, I recommend using a cast iron skillet for this. You can use another heavy skillet, but cast iron will get intensely hot and, if it’s well-seasoned, provide the perfect non-stick surface for cooking this delicate fish. You’re going to want to get the skillet insanely hot. Like smoking, turn on your oven fan and open a window hot. This will enable the fish to cook extremely fast and develop the burnt, blackened crust without overcooking the inside. Pat the tilapia filets dry with a paper towel, then coat each in the blackening seasoning, pressing the spices into the fish and covering every speck of surface area. Then, melt the butter in the hot skillet. Cook the fish for two minutes on each side (yes, only two minutes! ), or until fully cooked (you can tell if it’s cooked if it flakes apart easily with a fork). If you have extra thick filets, it may take 2 1/2-3 minutes per side. I had to cook my tilapia in two batches, so I divided the butter in half for each batch. 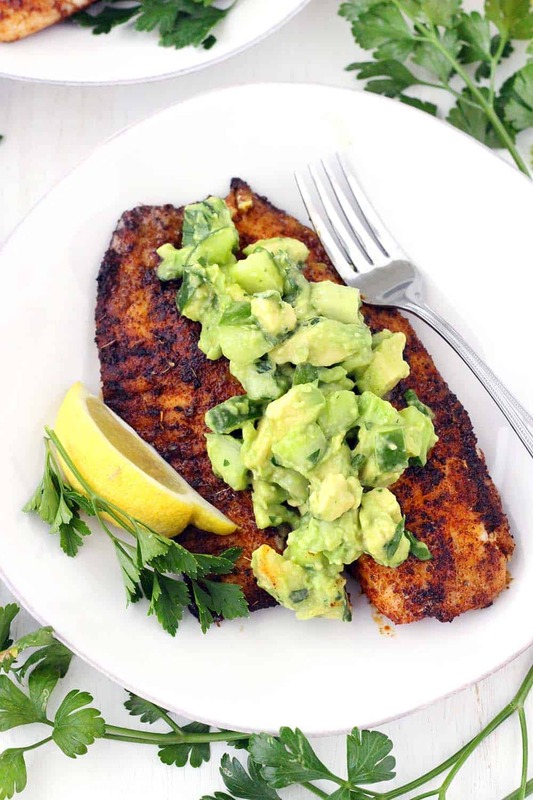 You can use this blackened tilapia in tacos, or use the same blackening technique for shrimp, salmon, chicken, catfish, or other proteins. We had this with Mango Quinoa Salad– a cool, refreshing, sweet salad that pairs perfectly with the blackened fish. It would also be great with this Thai Sesame Red Cabbage and Carrot Salad or this Mediterranean Chickpea Salad. 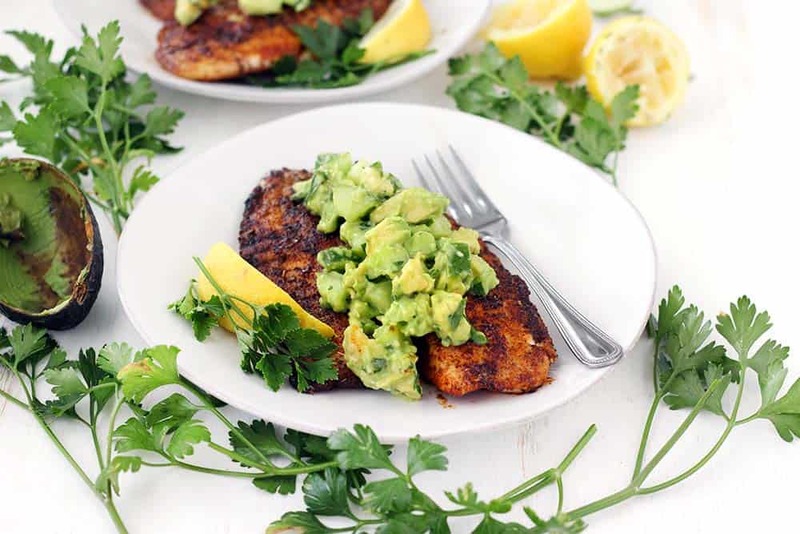 This super flavorful Blackened Tilapia comes together in less than 10 minutes!! Topped with a cool and refreshing avocado cucumber salsa, this is the perfect quick and easy low-carb recipe. Paleo, gluten free, and whole30 compliant. Heat a large skillet (preferably cast iron) over high heat until screaming hot. You might want to turn your fan on or open a window for this one! Meanwhile, pat the tilapia filets dry with a paper towel. Coat each in 1 tablespoon of blackening seasoning, pressing it onto the fish so it sticks on every part of the surface. Melt butter in the skillet. Add the tilapia and cook for 2 minutes on each side, or until fish is fully cooked and flakes apart easily with a fork. If you need to cook it in two batches, use half the butter for each batch. Meanwhile, mix the avocado, cucumber, parsley, lemon juice, and salt to taste in a small bowl. 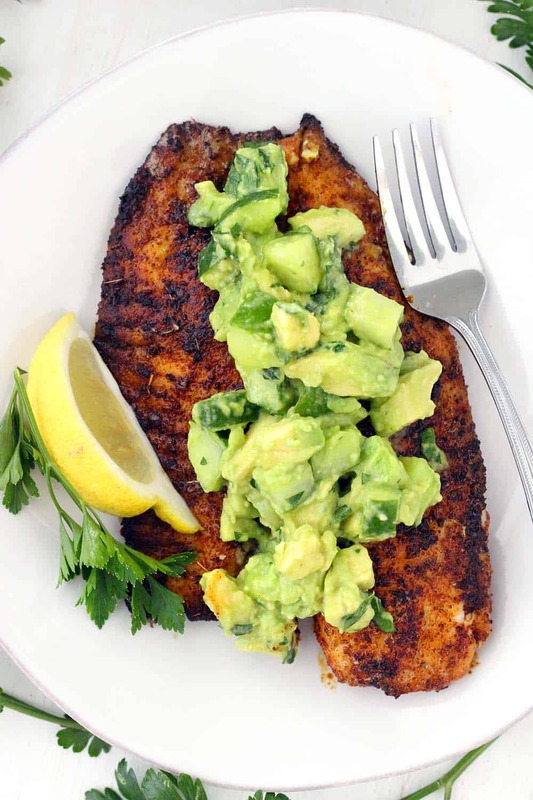 Serve blackened tilapia with the avocado cucumber salsa, with more lemon wedges (optional). For a dairy-free/paleo/whole30 compliant option, use ghee or olive oil instead of butter. Hey, Thank you for this tilapia recipe, we only eat fish twice in a week. I think we should make this next week! Hope you like it! It’s one of my favorites- perfect for warm weather! Just made this with 2 large tilapia fillets I got this morning. Wasn’t sure exactly how I was going to cook them. So, I started looking at recipes. I found this one and it seemed simple enough, and I love anything that has to do with avocados (which I got 6 of also this morning). 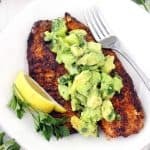 The fish is easy to make, mine stuck a little bit in a regular pan with avocado cooking oil, but nothing horrible, and I was still able to keep it intact. The avocado/cucumber salsa is simple, yet, very delicious. I used 1 whole cucumber and almost 3 avocados, some sea salt, a little lime juice, and I used fresh cilantro, as I did not have any parsley. It is also good by itself on multi grain tortilla chips, but works with the fish nicely. I wasn’t sure how it would be with blackened tilapia, but it turned out great! Will be making this again for sure! SO happy you liked the recipe! Funny thing- I actually used parsley only because I didn’t have any cilantro. I bet it tasted delicious with it!